LEXINGTON, S.C. - The man who police say killed his five children waived his first court appearance Friday because he is being "portrayed as a monster" and needs a mental health evaluation as soon as possible, his attorney said. Timothy Ray Jones Jr., 32, has been treated for mental health problems in the past, his attorney Aimee Zmroczek said. She would not specify what sort of treatment or problems he has had. "He is being portrayed as a monster. He is just a man and is trying to deal with this situation," she said. "He is scared and simply wants someone to guide him through the process." An initial appearance Friday was entirely unnecessary and could taint a potential jury pool and prevent him from receiving a fair trial, his lawyers said in court documents. Authorities said Jones killed his three boys and two girls, wrapped their bodies in separate trash bags and drove around for days across several states with their decomposing bodies before dumping them on a rural hilltop in Alabama. Zmroczek said Jones has been held in isolation under suicide watch. Lexington County authorities expect to transfer him to a state prison for his safety. In Mississippi, Jones' children were remembered at the Amory Church of Christ. A program showed a photo of each child smiling and offered a description of what they liked to do. It said the youngest, 1-year-old Elaine, loved giving high fives and kisses. The oldest, Merah Gracie, enjoyed dressing up like a princess, going to church, reading books and coloring. Two of the boys - 7-year-old Elias and 6-year-old Nahtahn - loved to fish. Nahtahn also liked to swim, ride his bike and dress up like Ironman. Elias dressed up like Spiderman. Their brother, 2-year-old Gabriel, enjoyed watching "Care Bears" and playing with the family. At the end of the description for the four oldest children, the program said: "loved wrestling with dad." On the pulpit area, there was a wreath on an easel with a photo of each child. Yellow and pink flowers and a colorful array of ribbons dotted the wreaths. Star-shaped balloons were tied to them.Jones killed his children at home "by violent means" about a week before his ex-wife reported them missing, Acting Lexington County Sheriff Lewis McCarty said. The motive and cause of death are still being investigated, authorities said. On Thursday, social services officials said they visited Jones' homes a dozen times in the last three years and investigated accusations of abuse. The children seemed happy and well-adjusted despite occasional spankings, and the family took a summer trip to Disney World and the beach, according to documents released by the Department of Social Services. Authorities never found anything serious enough to take the children away, but the documents show Jones as a single father and computer engineer struggling to raise his children. After the last visit - two weeks before the children's disappearance - a social worker summed up Jones' life: "Dad appears to be overwhelmed as he is unable to maintain the home, but the children appear to be clean, groomed and appropriately dressed," wrote the case worker, whose name was blacked out, on an Aug. 13 report. Case workers also made visits as Jones' marriage fell apart amid allegations his wife cheated on him with a neighbor. Jones' wife talked about being lonely and what a mistake the couple thought they made moving from Mississippi, where Jones' family lived. They moved after he got a degree at Mississippi State University and landed a job making $71,000-a-year job as a computer engineer at Intel. A therapist who saw Jones more than two years ago described him as "highly intelligent" and responsible, yet emotionally devastated and angry over his wife's alleged infidelity, divorce records show. More than a decade ago, when Jones was 19, he was convicted of cocaine possession and a crime spree in the suburbs of Chicago, where he grew up, that consisted of car theft, burglary and passing forged checks on his father's account. An intoxicated and agitated Jones was arrested at a drunk-driving checkpoint in Mississippi on Saturday, and authorities said he had a form of synthetic marijuana on him. Officers found children's clothes, blood and maggots in his sport utility vehicle. 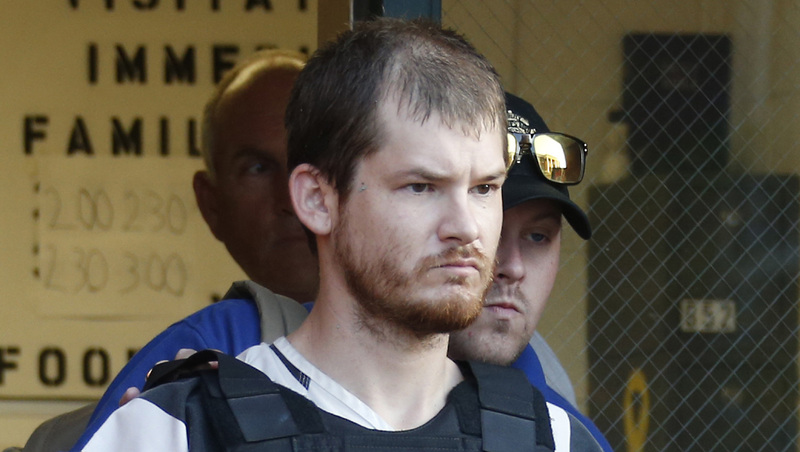 Three days later, he led police to the bodies on a remote hillside in Alabama.